Climate change has a significant impact in our daily life. This impact is especially notorious in High-Arctic ecosystems, and therefore, monitoring these regions has become a necessity for scientists and biologists. Due to the challenges the extreme weather conditions and remoteness of these areas constitute, applying traditional methods for data collection is not only unreliable and expensive, but most of the time impossible. Current sensing infrastructures – completely relying on fixed, stand-alone data loggers – simply do not represent the real processes taken place in the monitored areas. Hence, a new generation of independent, self-maintained data-loggers is starting to be indispensable. Also, the lack of specific frameworks, makes post data processing and analysis, a te- dious and non-maintainable procedure. 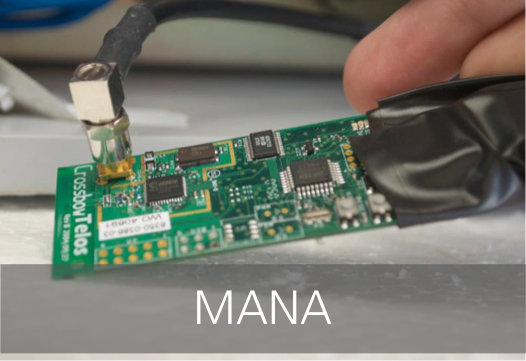 MANA – to which I contributed with my M.Sc. Thesis – addressed some of these deficiencies and set the base for improving High-Arctic Monitoring. This above, would be the formal description of MANA. In the end, what MANA is all about, is coming out with solutions for the challenges that need to be addressed for monitoring High-Arctic ecosystems. This is basically, monitoring a place under extreme weather conditions, a place that it is extremely difficult to access, not even being possible to get there in the winter season, and most important, a place that is of a very high interest for scientist and biologists. The main drawback of former infrastructures is that they do not face the problem of adapting data acquisition to events that might occur in the monitored area. For instance, if it rains or snows and therefore water quality parameters change, being able to capture this changes and explain them by mapping external conditions is extremely important in order to extrapolate this behaviour and obtain further conclusions. In order to test our results in the laboratory, we carried out a real deployment in lake Langemandsø, around 5km far from Zackenberg Research Station (74°30’N / 21°00’W) in Northeast Greenland. The deployment consists in what we call the Capoh Architecture, composed buy the Capoh Buoy and the Capoh Base Station. Basically, the Capoh Buoy is attached to a WetLab’s Water Quality Monitor sensor (WQM), which monitors limnic parameters – chlorophyl fluores- cence, dissolved oxygen, temperature and salinity. This measurements are transferred to the Capoh Base Station by means of a Wireless Sensor Network (WSN) based link (802.15.4). In the last revision – summer 2011- we use the Telosb platform + TinyOS 2.1.1 + BLIP. Also in this last revision, we have given a further step, as the Capoh Base Station acts as an adaptive data acquisition gateway, on the grounds that data is now transmitted to the Zackenberg station by means of a 802.11 link (5km away). Thus, data can be accessed from the Station without having to get to the lake. The next step is to make a 802.11 link to Daneborg Station, which is 40km away, in order to make the monitoring and data acquisition procedures being available online. In order to make simulations before carrying out the real deployment, we make use of Radio Mobile. In this way, we can make radio performance estimations and relevant calculations that help us preventing some of the problems associated to field work. T. T. Høye, E. Post, H. Meltofte, N. M. Schmidt, and M. C. Forchhammer. Rapid advancement of spring in the high arctic. Current Biology, 17(12):R449–R451, 2007. M. Chang and P. Bonnet. Meeting ecologists’ requirements with adaptive data acquisition. In Proceedings of the 8th ACM Conference on Embedded Networked Sensor Systems, SenSys ’10, pages 141–154, New York, NY, USA, 2010. ACM. A. Ailamaki, V. Kantere, and D. Dash. Managing scientific data. Commun. ACM, 53:68–78, June 2010.